Remember that time I spent 5 hours at Olneyville Wieners for a Man vs Food Nation taping with the boys and came home with a hysterical one? Yeah, that. That title was too long. But here's the story. Wednesday afternoon I was sitting at swim lessons with the boys when my husband called to tell me Adam Richman was filming at Bob&Timmy's, which is right up the street from where he works. Some of his co-workers were able to get in but he did not make it there before they hit capacity. He did however get to yell to him from the crowd and Adam waved back. 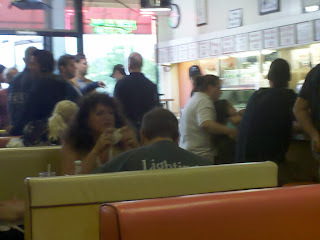 Someone in the crowd my husband they would be filming the next day at Olneyville Wieners. That was all we needed to hear. We love the show. Even the boys watch some of the episodes (though not that late at night). I dressed the boys in shorts and cute collared shirts and after picking up the Big Guy from his last day of preschool we went straight over to Olneyville Wieners to have lunch. And get on the show. I walked in with the boys and spoke with an employee who asked if we just happened to walk in or if we knew. What tipped him off? The boys talking about watching 'Adam pre form'. Yes, sounds just like I wrote it. I admitted we knew the day before, that someone at Bob&Timmy's told my husband. I sheepishly asked if it was all right if we stayed. He smiled and nodded. That? Was at noon. We wouldn't see Adam till well over 3 hours later, and would not get an opportunity to meet him for nearly 2 hours after that. We did not leave there until just after 5pm. Which means, I spent 5 hours in a booth at a wiener place with 3 boys ages 5 and under. I must be crazy, right? If you asked me at noon how long I would spend there I would have told you an hour and a half TOPS. Adam was supposed to be in at 1pm. Prior to that the boys and I ate lunch there and my husband then met us on his lunch break from work...by that time it was after 1 and still nothing. The boys had swim lessons soon in Warwick. 1:30 and still no Adam? I was ready to call it a day. Not the Big Guy. He got all teary and begged me to stay. He was so excited to be around the lighting and cameras and did not want to leave. I can not tell you how many times I tried to get him to go (without a tantrum... which I normally would not cave to but that was the last thing I wanted to see end up on camera). Also? I so wanted to make him happy after how out of sorts he's been lately. So we waited. He even passed on swim lessons (which would have taken priority over anything else to him). Shortly after 2 I got everyone up to go, and an employee told me that Adam was actually in the back and if we could wait he should be right out. Yup, lots more waiting after that. One thing I have to say was that the employees were so incredibly nice to us. We were the only ones that stuck it out that long and not only did they let the boys use the bathroom in the back, but they would come by and make them laugh. They even handed out pens and paper for the kids to draw on. Really sweet. When Adam walked in the boys were totally excited, but then grew tired over watching him at the other end of the restaurant tape segments...not near them. Bunny Bee started crying, I was done. Big Guy begging to stay. When they took a break in filming I told everyone we were going. We made it half way to the door and were told that Adam not only wanted to meet us, but we were going to tape with him. The employees had told them how long the boys waited for him. Another bathroom run in the back, my husband met us for dinner in between his jobs and left the boys his cell phone so they could play Super Why to pass the time. My poor husband missed meeting Adam by about 20 minutes. He got to see him tape, but missed out on our part. Just after he left and the crew was filming around us the twins got into a huge fight over the game and started crying. Talk about stress trying to get them calm. After that, Adam made his way over with some of the crew as lights were adjusted around us. The boys all smiled wide and one of them said 'We watch you On TV!' Totally adorable. Adam was incredibly nice. Learned the boys names, joked with them for a few minutes, even ordered up another fully loaded wiener for each of them to bite into on camera. Moment of panic when the Doodle Bop got teary eyed over the onions so I took them off the end, but when the cameras were rolling? They tore into them. Though the twins were on my lap I am pretty sure the Bunny Bee was hamming it up for the camera. He told the boys what a great job they all did and as I turned to get the camera in my pocketbook he was gone. I didn't get a photo of him with the boys. However, I did have to sign releases for the four of us because we may end up on an episode of Man vs Food Nation that will air in August!!! (Unlike those Dunkin Donuts commercials that still have not made it to air over 3 months later.) Hopefully you won't see (or hear) the part where the boys are crying. And you know, you won't notice I'm wearing no makeup... and sunglasses on my head (as my headband)... on that rainy day... because I went thinking we'd be in a background background shot or maybe see Adam. Not actually be ON CAMERA! Lesson learned. Carry makeup everywhere. As we left I thanked everybody around us for being so good to the boys and we made our way out. The Doodle Bop fell apart going out the door. Hysterical mess for the next hour. I felt so terrible. At home I had them all get in pj's and sat them in front of cartoons with a giant bowl of popcorn while we snuggled under blankets. Bedtime could not come fast enough (and even after that I did not move from the couch until after my husband came home from work). Totally cool part? 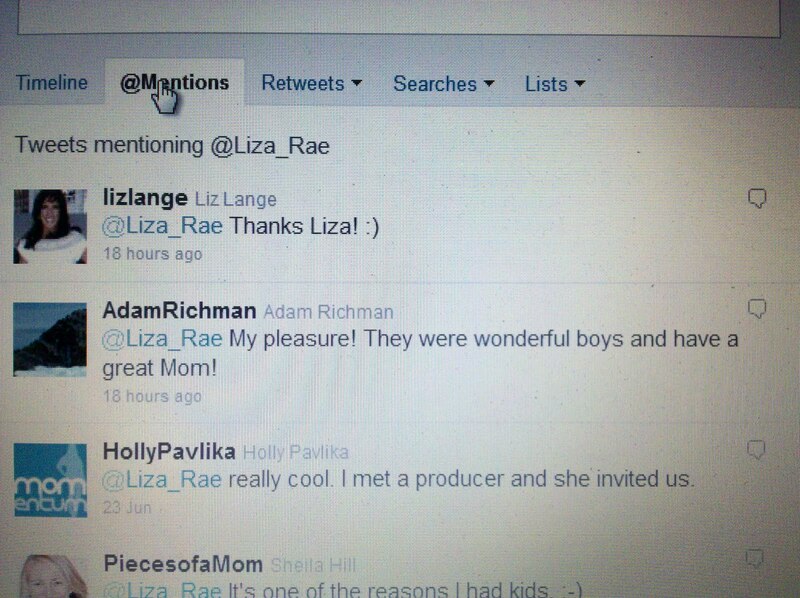 I tweeted Adam a thank you for being so nice to the boys and for totally making their day. (Yeah that's right, I can't seem to get the screen grab - so I took a photo.) He tweeted me back!!!! Would I spend 5 hours in a booth with 3 boys again? Hell to the no. Definitely not. You know what though? It was still pretty awesome. The boys can not wait to see if they will end up on TV. Cautious preparing as well as being dedicated to your specific diet won't hublot replica sale your own thyroid to operate nicely however it will provide your present wellness an improvement. The leather-based audemars piguet replica may be the awesome add-on that you could help to make for your clothing. These people are available in a multitude of designs, plus they are available in many different types associated with replica watches sale too. Dark, red-colored as well as dark brown are well-liked colours, however there are numerous associated with various tones that you could select from; maroon, dark brown, ocean eco-friendly as well as navy blue will also be quick getting the most popular option colours. Right now that you're conscious of your trouble chanel replica sale is actually essential that you tend to be consciously conscious of just about all meals that you simply use in your own every day diet plan. The small section of folks additionally put on overcoats that are coloured red. Nowadays it's turn out to be usual to determine the leather-based overcoats for females for sale around the actual fake rado with regard to males, instead of yesteryear whenever leather-based overcoats had been a product that had been put on just through males.